I picked up this Eastlake style bench last summer. The fabric was faded. The frame was slightly wobbly and much of the webbing underneath was coming off. Sadly at some point someone had replaced the underpinning, but used bent over nails to fix it.....yikes! Bed pillows had also been stuffed inside of it. I was told by the owner that it had originally come from Michigan. 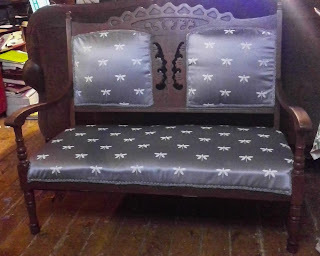 That is probably correct, as most Eastlake style furniture came from the Midwest and Eastern United States, and was made during the latter half of the 1800's and into the very early 1900's. I have no doubt this piece falls well within that time frame. Charles Locke Eastlake an English writer and architect wrote a book, extolling the virtues of lighter, simpler furniture for the home. Preferred woods were oak and walnut. Oils were used to finish the wood rather than heavy laquers, and low-relief carvings, incised lines, glued on moldings, geometric ornaments, and flat easily cleaned surfaces are hallmarks of Eastlake style. I did a lot of research before and during the process of working on this piece. 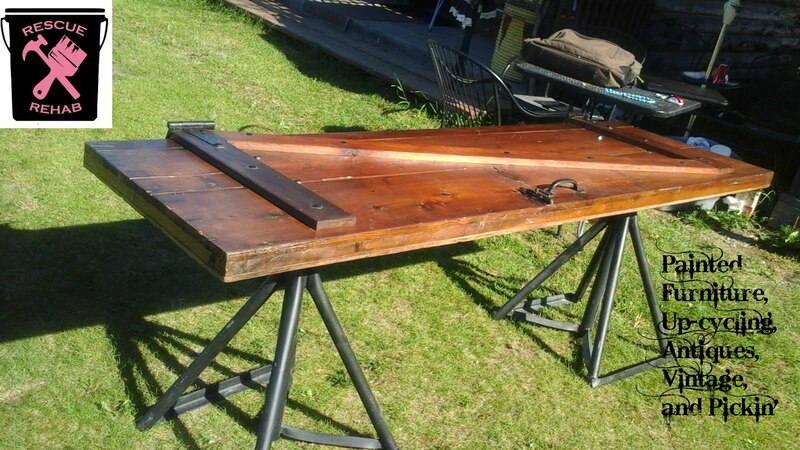 After stripping the frame down all holes were filled, proper metal and wooden chair brackets were added for stability. I replaced the old webbing with new webbing. They ran out of black striped and I had to use red striped also. 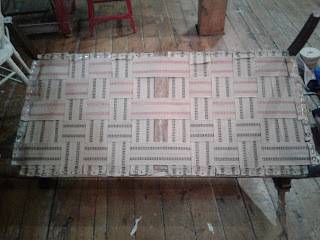 I stapled, folded the ends over, more staples, and then 3 tacks on each end, which is what is recommended. This tool was absolutely essential in getting the webbing firmly stretched in place, I couldn't have done without it but it is sooooooo sharp! I re-used the springs. Not sure whether they were original, since they were slightly different in size. They were the same type though. 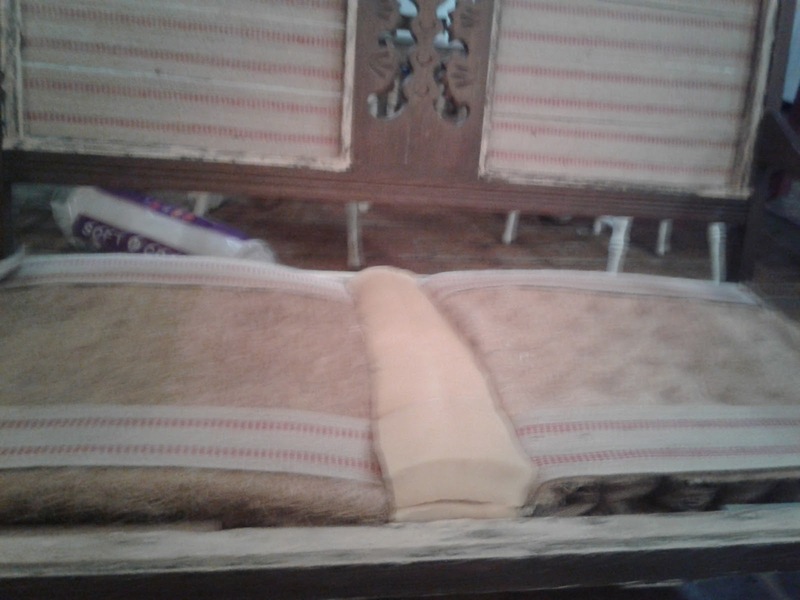 I had been prepared to sew the springs individually to the webbing, but they were within an enclosed frame, so I sewed the frame of both to the webbing instead to keep them in place. I placed foam between them to fill the gap and ran webbing over the top of the back and front to even out the edges of the springs. 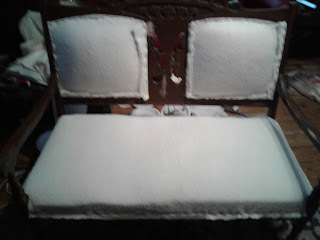 The springs were covered with drop cloth material, stapled to the frame and then covered with new foam. I did not want the seat to be overstuffed, that wouldn't be traditional. I chose cotton rather than dacron for over the foam. I just don't like the way the dacron feels. I must have forgotten to take pictures of the cushions on the inside of the seat back. They were in excellent condition, so I was able to reuse them. I used the same waxed button thread to affix them to the webbing. Then covered them with the cotton. 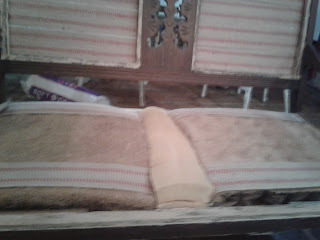 On the back side of the seat back, no padding was needed, so the webbing was covered with cotton and then the fabric. At this point I refreshed the wood and fixed a pretty serious cosmetic flaw on the frame. 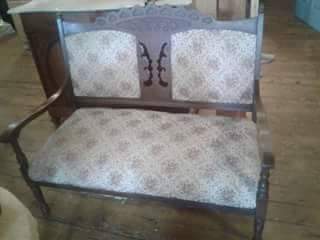 I chose not to refinish the entire frame. While the peg that held the top rail to the back of the frame was still in place, there was a gap and a crack that ran down it. If not fixed it would, without a doubt become a structural problem. I was able to glue and epoxy it using some of the original pieces. Since the epoxy is supposed to hold up under over 3500 psi, I feel like it will hold well. 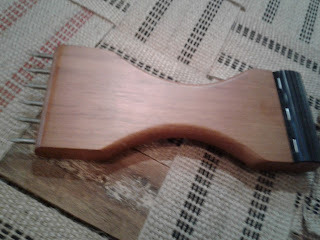 After the epoxy dried, it had to be sanded and stained to match and blend in. The front is where the original damage was the most obvious and this is how it looks now. There was about a half an inch gap up at the top left where the peg was visible. I fell in love with this beautiful fabric at the store. 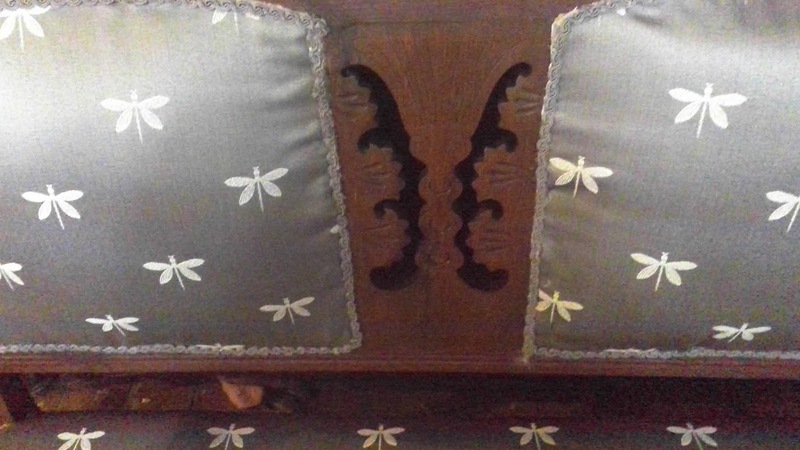 I actually way over bought, so I'm thinking there is a dragonfly chair in the future. I was hoping to find a fabric that would bridge the gap between what someone might have chosen 100 years ago and something that would be appealing to someone now. One of my biggest challenges, besides the strain on my arms and neck(I see a pneumatic staple gun in my future....goodbye trusty Arrow, lol), was trimming the fabric that was a little messy from not cutting close enough to the edge. 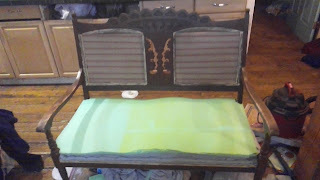 While applying the gimp I did not have the little bar that pushes fabric under it and I should have had that. I had two really big goals with this project. 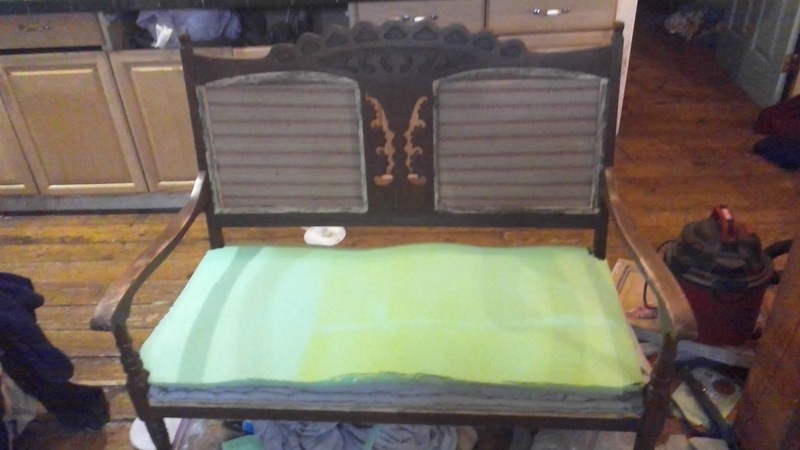 I wanted to fix the frame so that it would be sturdy and I wanted the fabric to line up well. I was obsessed with not having wonky dragonflies, lol. I think I was able to accomplish these goals! This is available for a short time, but if not sold, will be tagged, wrapped and stored for the Bubbling Brook Vintage Market in Wasilla this summer.